We started Unshackled Ventures in 2014 with a simple entrepreneurial vision - help immigrant founded startups succeed faster. As a first generation American and a first generation immigrant our pathways first crossed at a startup in 2010. Through our personal entrepreneurial experiences, we saw that our diverse backgrounds led to incredible and innovative thinking. As we worked with some the most successful VCs, we also understood the best partners provide much more than capital - they help alleviate time consuming distractions and obstacles. This is especially needed for early-stage, immigrant founded startups. By bringing together immigration support and venture resources we knew we could support some of the most brilliant minds in America succeed faster. 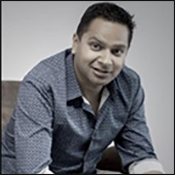 Nitin is passionate about building practical solutions that have a big impact on people�s lives. His personal experiences and those of hundreds of startup teams with founders on visas was the inspiration behind the framework for Unshackled. Still on a visa himself, he is excited about the opportunity to level the playing field for all entrepreneurs, whether born in the US or elsewhere, to start and grow companies in the US. He claims to have the best job in the world � helping the brightest entrepreneurs solve massive problems! Nitin previously founded Trymbl, was part of executive team at Kno, built a startup-focused strategy practice at Deloitte, and traveled across ABB�s locations in Asia-Pacific. He holds a Bachelors from Delhi University. Geospago By leveraging the cloud and modern smart devices, Geospago frees businesses from the constraints of large hardware investments and gives an easy to implement solution to execute and manage processes. We use the computing power that people carry around in their pockets and match it with enterprise capabilities on security, analytics and integrations. GridRaster GridRaster provides the infrastructure layer to overcome device limitations � compute and battery, by intelligently harness the compute power of the mobile device and cloud to power compelling VR/AR experiences. The solution provides high-performance graphics with ultra-low latency while hugely improving battery performance. The technology drives mass adoption of VR/AR by dramatically improving the reach of exciting content and bringing breathtaking new experiences to users. Immediately Immediately is mobile sales enablement, designed for the always-on workforce. Immediately brings the full sales workflow into one mobile app designed to enable capturing opportunities and closing deals in real time. From getting intelligence on leads, to sending instrumented emails, to making and logging phone calls and updating opportunity status. Immediately is the sales rep�s best weapon. We plug into Google Apps and Salesforce to integrate seamlessly with existing workflows. onTarget onTarget is a visual collaboration solution for construction industry. onTarget provides a single interface, with real time project management integrated with 3D BIM models, to ensure the entire team can execute the projects on time and on budget.